A Simple Jew: Guest Posting By Chabakuk Elisha - Kosher Pigskin? "There should be thought about tznius concerns, language concerns, and even moshav leitzim concerns...."
Moshav leitzim is more than just a concern when attending such events. Ask your Rav but it is a very real halachic problem. We need our relaxation, each according to his own individual needs (and not rationalizations). Nevertheless these events, events of passive entertainment, are not just bitul Torah but they promote an attitude and lifestyle of bittul zman. At the same time this forum is one of people searching to cling to Hashem. It may not be wise to bring this up with many people. "However when there is a reason for doing so such as with theaters and [circus? ], which are [mentioned] in Avodah Zarah 18b, which are leitzanus, there isn't an issue of avodah zarah, even though it is prohibited on the side of leitzanus, and all that go there transgress the prohibition of moshav leitzim and bittul Torah--not only at this moment-- but he will be caused to completely neglect Torah as explained there. And all the more so with the theaters found now in our lands, and so with sports arenas." Again, ultimately if this is an issue for you consult your Rav and don't rely on what you read online l'chumra or l'kula but it seems to me a very real issue. Yirmiyahu makes some strong points, and I'm inclined to agree with him. However, I remember hearing that an American-born Litvishe gadol in Eretz Yisrael once said that he can't come back to this country for visits without checking the sports page of the newspaper! This Rosh Yeshiva, too, grew up in a time and place where this stuff was part of Jewish life here, even in the religious community, and he still has it "in his blood." However, I never heard that he OK'd going to the sports arenas themselves. Its a shayloh. "However, I remember hearing that an American-born Litvishe gadol in Eretz Yisrael once said that he can't come back to this country for visits without checking the sports page of the newspaper!" In this context it appears to me that the din of "Moshav leitzim" would depend on attending the game itself. Playing sports and perhaps following others doing so at a safe distance would probably only be a bittul Torah issue, meaning if there where legitimate reasons, relaxation etc. there is room to permit it. I also did not mean to take away from Chabakuk Elisha's suggestion to be dan lkaf zchus others who do attend such games. Your theory of "there should be though about language and tznius concerns when, let's say a father takes his son to a game, is not realistic, let us be practical and admit that there is NO WAY to avoid being exposed to street language and untzniusdik things when attending a ball game in a stadium...no way! The second point, I heard from Rabbi Weinberg z"l and I'll try to explain it as faithfully as I could: Football game which involves a good amount of violence, pushing and hitting...etc And since a jew is not allowed to hit another jew, even when playing, even if the jew asks to be hitten, therofore playing football is simply assur, and watching jews (when there are jews in the team) play football involves some halachik issues. I thought I said that people need to keep those considerations in mind, didn’t I? 1. “Bichol Derachecha Deahu” can equally apply to sports. 2. A museum, zoo or a park have the same shaylos as a ball-game might have, and I think they all have their place. We can 1. See niflaos haBoreh, 2. Relax, and 3. 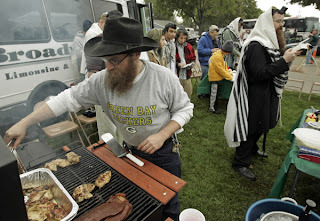 Maintain a Jewish attitude, at your local sporting event just as we can with all similarly pareve forms of entertainment. 4. Playing or participating in sports is not just perhaps acceptable but IMHO is a necessity. There is nothing wrong, and I think it should even be promoted more, with childen playing active games. Playing football is a Halacha shayloh??? You can’t be serious; Football is not a sport of fighting at all, so I really don’t understand the objection (however, I would agree that boxing or wrestling isn’t appropriate)…and seriously, anyone that looks at Tanach would have a hard time squaring that with what you say bsheim Rabbi Weinberg – I think this may be a case of over-applying a concept or quote. "I thought I said that people need to keep those considerations in mind, didn’t I?" Going to a sporting event or theater is not a consideration of "moshav leitzim" it is by definition "moshav leitzim". Under typical situation it would not appear that the usual factors which permit something that is otherwise bittul Torah are effective in changing the halachic status of a moshav leitzim. The halachah prohibits these even when they are "Jewish". "2. A museum, zoo or a park have the same shaylos as a ball-game might have, and I think they all have their place." A zoo is not, as I understand it, "Moshav leitzim". I believe there is a specific psak of Rav Ovadiah Yosef shlita on this matter. Zoo's are driven by the individual, one is not part of the crowd being given a show. "You can’t be serious; Football is not a sport of fighting at all"
Having been a lineman in highschool I beg to differ (though the coach's might agree to this characterization of how I played :) ). "Playing or participating in sports is not just perhaps acceptable but IMHO is a necessity. There is nothing wrong, and I think it should even be promoted more, with childen playing active games." I agree, but even eating is a necessity and it is essentially on muter when done to give us koach to learn Torah and do mitzvos (O.C. 231). Certainly something which is less necessary, which can be put off more easily, must be done with the intent that we are maintaining our health so we can continue doing Torah and mitzvos effectively. I hear you, but I can’t really fully agree. 2. I don’t see the distinction here – how is a contemporary sporting event “by definition” a moshav leiztim” any more than any other form of entertainment? 3. While I am aware of R’ Moshe’s tshuva, it makes me wonder…because, you know, R’ Moshe’s Yeshiva (MTJ) has always had sports and completions with spectators. Moreover, R’ Moshe encouraged camps to provide sports and pools for the children to relax and enjoy themselves at set times (Actually, now that I looked around, a “Google search” provided me with this: http://www.besr.org/ethicist/sportingevents.html ). 4. While this is less true in Chareidi circles, certain frum communities embrace sports without concern (R’ Hirsch in 19 Letters takes the position that there is no problem, and I have been told that R’ J.B. Soloveichik did as well). So, while it may not be universally held as ideal, it most certainly isn’t a clearly forbidden pursuit – v’yeish meikilim. 5. I seriously don’t think that the ideal in Baseball, Football, Basketball ort Hockey is to injure the other player. And even when you were a linebacker, don’t you think that the goal was to stop the offense from scoring and not to injuring anyone? scroll down to "5768 school year" and click on "Avodas Hashem and Sports"
Rabbi Bezalel Naor has some intersting things to say about Rav Kook's view of athletics in the introduction to his translation of Orot. It is really first rate. You should read it when you have a chance. running into other players to push them off to the ground...etc. a football game BECAUSE of the violence involved, the only problems there are with watching a football game have to do with chukas hagoyim. Sounds good - IY"H I'll look for it! Oh well, I hope there is something shayloh-free that people can do... In any case, I assure you that many rabbonim are mattir playing (at least "two hand tuch"-)football. 1. I must be upfront that I have no leg to stand on when it comes to learning Gemara. Many, most, or all of you can do better than I. Nevertheless while the source for this, Avodah 18b, does mention the factors of Avodah Zarah and Shifchas Damim it does not seem to be the motivating factor for the prohibition. Indeed it would seem to me that these factors would be issurim in there own right, while the reason the Gemara discusses is because it will lead a person to bittul Torah. What does appear clear to me, however, is that the poskim do not appear to consider the issur of “Moshav Leitzim” as being the motivating factor for this issur because they applied the issur to theaters and circuses of their own day where there where no gladiators nor where they held in Churches. Furthermore they said the issur applied even when they were “Jewish” functions, see the Mishneh Berurah 224:3 based on the Magen Avraham. 2. In light of the fact that the poskim, from what I have seen, do not see the avodah zarah or violence as the problem (or not the problem in question) these events are by definition “Moshav Leitzim” because they are the events described as such in the Gemara: going to the stadium and watching performances. 3. First of all one should always give precedence to what it brought down in halachah and not what we see done. I would love to see heterim, on any topic, at least to make it easier to dan l’kaf zchus. I have not seen them on this topic. That being said I have no problem with people playing sports, as I believe I have indicated. Playing sports is a davar reshus. I am concerned about the issur moshav leitzim. Attendants at a high-school basket ball game might be different because one is not going because the skill of the players is so entertaining but because you have a personal connection to the team, being a relative or a classmate. 4. If you’re speaking about playing sports, fine. If you’re speaking about watching spectator sports then one has to deal with the poskim and I have not seen this done. 5. “And even when you were a linebacker, don’t you think that the goal was to stop the offense from scoring and not to injuring anyone?” I didn’t sign up for soccer did I? ;) Seriously though, whether it is intentional or not, it’s a P’sik Reisha. Just because one doesn't want to injure someone doesn't mean they don't want to hurt him. A bruise covered my biceps for the duration of fall, just from practice. The goal of a defensive lineman is to get through the offensive line so he can “light up” the quarterback. But the problem with playing football is not one of moshav leitzim. 6. I do not believe I ever said sports cannot be used for avodas Hashem, I said in order for it not to be bittul Torah, or in order for it to be consistent with O.C. 231, it must be done directly or indirectly to perform mitzvos. This is axiomatic to Torah. Yes, I checked one more time with his talmid, for playing football it is a psak, and B"H for the great minds of this generations who could find these halachos. I tried to make this clear in my post, but let me reiterate that I do not promote going to ball games, and sure, there is plenty of room to be machmir. That said, I still fail to see the inherent “Moshav Leitzim” status that you suggest exists for ball games as opposed to any other davar reshus; we even find in Pirkei Avos that a dining room table can be a moshav leiztzim if Torah is not discussed. So, I would think that if a couple Jews are relaxing at a ball game and they discuss Torah ideas and Jewish matters and behave as would be appropriate for a frum Jew, there would be plenty of room for this within the parameters of halacha and Yiddishkeit. Yes, the MB does seem to be machmir – but we acknowledge diversity of opinions in Yiddishkeit. We also find that (for example, see Gemara, Avoda Zara Daf 31, IIRC) the psak must be accepted throughout Klal Yisroel for it to become established across the board. I dare say that there are quite a large number of frum Jews that attend ball games (I hear that the frum population is so well represented at Yankee/Shea stadium on Chol Hamoed Pesach that one would think 1/4 of the NY population were frum Jews). To set a standard that the threshold for acceptability depends on avoiding matters that “might lead to bittul Torah” is surely laudable for an individual, but that’s quite a high standard to impose on others, and I doubt there is anything other than limud haTorah that could truly fit that definition. Chumros are easy to find – and I could find a pretext to asser pretty-much every single davar reshus on some grounds should I be so inclined. But you wanted mareh-mekomos… Well, to be honest I don’t know. I would agree that attending sporting events is not a l’chatchila (except maybe according to Rav Hirsch who I mentioned previously), but I do find it interesting that a number sifrei halacha, like Shmiras Shabbos K’hilchosa (16:9), state that it is improper to attend a sporting event on Shabbos -- since there is public chilul Shabbos going on, and it is not in keeping with the sanctity of the day –- for if it was always assur, why would we be discussing it only with regard to Shabbos? And the same question applies to sifrei Halacha that discuss attending sporting events while in mourning. Moreover (to me), the fact that frum yeshivos across the USA play these sports, have spectators, and attend sporting events, tells me that the practice is not assur. As for playing football, as surprised as I was to hear someone come out with an issur, I subsequently realized that the football playing I had in mind is probably different than the one he was addressing. They football playing I had in mind is the schoolyard type of game where nobody is really seeking to hurt anyone at all, and perhaps a serious program would be another matter. I can understand that a college level program might be different (but don’t the pads help? ), however a bunch of yeshiva kids playing either two-hand-touch or semi-tackle football is seldom more dangerous than relay-races. So, to sum up, I agree with you that it is better to avoid sporting events -– and you won’t find me at a Football game. But, I don’t subscribe to the “one acceptable path” view – I prefer standardizing wider, more inclusive, less confining, limitations. Yiddishkeit has so many syagim and gezeiros already, there is little need to force Jews to give up things they enjoy and leave them with a dryer, less appealing, Yiddishkeit. “Derachea darkei noam:” Yiddishkeit is pleasant, and it should be that way. So, I maintain that for those who do (or did) enjoy sports, it has its place within a Torah context -– and may it be the biggest concession one makes! I’m not sure I understand what you mean. Does that exclude sitting at a ball game? If, let’s say, I was to take my son to a ball-game and we spoke of Torahdike things, relaxed, built on our relationship, made brochos before and after eating ate Kosher food, davened with Minyan, and generally spent a pleasant afternoon together, is that somehow contrary to your standard? Now, last things first: Orach Chaim 231 is not “my” standard, I only wish that I could live up to it. I have provides sources, both specific to ball parks and general, which would classify them as ossur, not a davar reshus. Orach Chaim 231 only applies to things which are muter, such as playing sports. If you can bring sources which permit going to stadiums then it would fall into this status as well, when done with an intent which qualifies. Eating in a group can be a moshav leitzim, a “theater” is a moshav leitzim. The Poskim did not say any leisure activity was moshav leitzim, but they did say going to the “theater” is. I see no nafka mina between going and watching clowns and magicians (see Rashi on Avoda Zarah 18b) and watching any other entertainment, in our case sports. Nor do the Poskim seem to make such a distinction, they are certainly “places of amusement and pastime”. Yes, I wish to bring sources, because that is the only way to find out what the Torah has to say. If there is a legitimate counter-view, it will be in the sources as well, where the halachic reasoning can be evaluated. Otherwise, “There is neither wisdom nor understanding nor counsel against Hashem” Prov. 21:30. One could very well make the argument that this is a case of “it is preferable that they transgress be-shogeig rather than be-meizid” (see Rama O.C. 338:5). I have not seen this applied in our case but I am not inclined to bring the topic up (I know that might be hard to believe after all this). Insofar as it has been brought up, particularly in such a forum as this which I reckon to only hold the attention of those who wish to draw near to Hashem, I feel it is necessary to raise the issue. Maybe people shouldn’t be told it is ossur, but without sources I don’t see how it can claim to be part of avodas Hashem in the face of these Poskim. I don’t mean to say that your position isn’t legitimate; indeed it is. Yet, I still think we can also legitimately apply a limited interpretation here (nevertheless I also still DON’T encourage people to be meikel). The Gemara in Avoda Zara, it seems to me, can be understood to be speaking about the specific circumstances of those times (watching gladiators or bulls killing others for entertainment, as we see that the Gemara and meforshim speak of the general shvichas damim, gilui arayos & avoda zara that went on there). People who partook of those forms of entertainment were certainly IN a moshav leiztim. But here is where a distinction can be made: Moshav leitzim is a problem, not arenas. Those arenas discussed in the Gemara (due to what took place there) are therefore assur -- as it was impossible for it be otherwise –- however, our stadiums (where those atrocities do not take place) are not de-facto moshvei leitzim, and attending them would become davar reshus (or, perhaps, what some call “good clean fun”). Then the Tanna poetically applies the passuk Tehilim: “Ashrei (happy or praiseworthy or advanced, depending on how you translate “ashrei”) is he who did not follow the counsel of the wicked and did not sit at a session of jesters, but his desire is in Torah and Hashem.” The Tanna goes on to apply that he who takes part in these things ends up neglecting Torah – because he who would attend events such as those (celebrating avoda zara, shivchas damim and gilui arayos) obviously does not desire Torah (and will therefore neglect it). I do not think that the Gemara is saying that anything that might be thought of as to lead one away from Torah study is assur – because any dvar reshus can be looked at as possibly leading one to neglect Torah study! It’s specifically things that are of such a nature as those ancient forms of entertainment (again: reveling in matters bordering avoda zara, shfichus damim & gilui arrayos could seem to be the determining factor) that are a surefire road to neglect of Torah Study. I’m not a rov though, and I’m not a Talmud Chochom either – I’m just repeating the way we covered it in my Daf-Yomi shiur. The point, though, is this: While it is surely better to avoid these things – as I’ve said a number of times – the fact remains that a large percentage of frum Jews – plenty of rabbis included – find it acceptable. R’ Moshe’s tshuva notwithstanding, many talmidim of R’ Moshe clearly don’t take such a hard-line (and there are anecdotal examples of R’ Moshe speaking to people about ball games that they were attending and he didn’t tell them it was assur – and had it been an open & shut case, he most surely would have). Moreover, R’ S.R. Hirsch Z”L is pretty much matter all forms of cultural interests, as do people in the more modern world (such as R’ J.B. Soloveichik). And this is my entire point: Lechatchila it should be avoided, but with that said, room can be found for this and it has its place within the gedarim of Torah & Yiddishkeit. There is much more to say, but I am short on time. IY”H, I will try to find tshuvos on the matter, but my time is so limited these days that it may take a while (even finding the time to write these posts and comments is incredibly hard). "Puk Chazi" (look at the common practice). If your community/rov is opposed, then it is forbidden for you - and if your community/rov allowes it, then it is permitted. So is Rabbinic (our version of) Judaism, and so has it always been. Where do we see that this concept is used to uproot explicit sources? The key here is that Chazal and earlier sources are not speaking of our specific case - and that's why it's hard to say that they are the same. For example, the Rambam also forbids stadiums, etc (as well as foreign clothing trends by the way), but he classifies it as connected with Avoda Zara (actually, we should look it up - does anyone know where to find a link online to Sefer HaMitzvos, Lo Saseh #30?). I maintain that although it is preferable to avoid them, I do not think it is assur lechol hadeyos - but yes, we would need to find contemporary rabbanim that discuss it (since only they would be discussing our case). I still haven't looked up R' Moshe's tshuva to find his specific wording, and I haven’t managed to track down recent halachic authorities that would discuss it (remember that this is only likely to be discussed in communities where it is an issue) yet I am absolutely confident that there are deyos lehakel. Just because the concept of stadium is similar to the ancient concept of stadium does not make them the same. All that said, I am a little uncomfortable on this side of the issue – because, as I said, it is not ideal. You want to say that it is assur, making all those (quite a large % of Frum Jews) who attend into ovdei aveira; I disagree with that entirely, and I will only take such a position when there is no room to maneuver altogether. "And, um, yes - the way Yiddishkeit works is that you follow your rov; I am surprised that you would have a problem with that..."
Where did I say otherwise? You argue that our case is "different". You can perhaps draw a nafka mina between the shita of the Rambam, but what about all of the achronim cited? I look at it within a context. Halacha isn't often B&W, and the separate individual strains of Yiddishkeit each have their own "5 chelkei Shulchan Aruch" (the key, of course, being that they are within the parameters of Torah legitimacy - a different conversation for a different day). So, when I see a large segment of religious Jews and rabbis that condone a practice, I am compelled to view it as legitimate. Therefore, I apply that here - and I do see room for it from the Gemara & Rambam. Furthermore, I'm confident that there are gedolei Torah allow for it as well (as I said before, R' Hirsh and I have heard bshem R' Soloveitchik, but I haven’t confirmed it). As for R' Moshe, I haven't managed to read the tshuva yet, but even if he takes a stronger view, that does not mean that everyone must follow his psak. And as for the Chofetz Chaim, I haven't managed to look it up yet either, but 1. I don't know that he is talking about our specific case. 2. If his psak was not universally accepted (not every MB is the final word), then it's an opinion, but not the only opinion. But I understand your position, and it's a fairly strong one. I also recognize that I haven't produced a "smoking gun" citation with a major posek that specifically is mattir our case. Yet, I still am confident (based on my opening remarks of this comment, especially the 2nd pragraph) that there is a tzad lehakel. Sorry if I'm getting to be abnoxious. Going back a bit you said, "I do find it interesting that a number sifrei halacha, like Shmiras Shabbos K’hilchosa (16:9), state that it is improper to attend a sporting event on Shabbos -- since there is public chilul Shabbos going on, and it is not in keeping with the sanctity of the day –- for if it was always assur, why would we be discussing it only with regard to Shabbos?" See footnote 25 on that seif: "וסי' שז סע' טז, ובמ"ב ס"ק נט, וע"ש לענין ימות החול" where he says to see "our" Mishneh Berurah regarding going to sporting events on weekdays! HaRav HaGaon S.Z. Aurbach zt'l put a great deal of effor into reviewin the footnotes of SSK so it might be safe to assume that he would agree that the M.B. "is talking about our specific case". I had written, "A zoo is not, as I understand it, "Moshav leitzim". I believe there is a specific psak of Rav Ovadiah Yosef shlita on this matter." "Indeed, it appears that the matter is clear to permit going to a zoo to observe the creation of Hakadosh Baruch Hu because a person's soul marvels exceedingly from seening the work of the Creator's hand, as the verse explains, "How wonderful ar Your works...."
You might be interested to know that he goes on to cite Ma'aseh Rav[s]. After looking at it he does bring this Gemara, but the aspect he focus on and his main topic in the tshuva (I believe it was about bull fights) seems to be Tzar Ba'alei Chaim, rather than Moshav leitzim per se. Regarding the RSRH ztl, was he speaking about playing or watching? Was this in the 19 Letters (I've been skimming to try to find it, I see no trace in the index)? Regarding RYDS ztl there is story I believe I have seen several different places (which I didn't find unreliable at the time) that when asked whether it was muter to go to the movies during the three weeks he replied that it is just as permitted as any other day. It was noted that this quite possibly implied that there was a problem. Frankly it seems to me the most natural explanation that he felt this halachah applied but it was best not to make a big deal about it, "let them transgress b'shogaig". That doesn't necessarily mean he felt the same way about sports but given everything else I see little reason to assume otherwise. 1. I takeh didn't notice the footnote (I was looking quickly), but it would seem to me that the footnote is still not the text; the fact that the text deals with it does seem to show that there are people who find it acceptable (and then the footnote points out that this may not be a good idea - and I would agree with that. Yesh kama machmirim). But, for example, I have yet to see a sefer discuss eating chazzer on Pesach, and add a footnote saying that it is not advisable to do this during the year. 2. I really, really, still don't understand why a zoo is better. 3. R' S.R.H. discusses the merits of taking part in cultural experiences/interests (museums, music, and the like) where aveiros are not being committed -- I have been told that would include most contemporary spectator sports. 3. What I have been told b'sheim R' Y.B.S. was that he never told those who went not to go and he even shrugged away the question as not a concern worth addressing. Yes, it is possible, like you mention, that he wanted them to remain a shogeg, but I would think that that wouldn’t explain why he took positions on other things - meaning, that if it was a open & shut case he most likely WOULD have said to cease & desist. Once again (beating this dead horse BIG TIME now), I think it's not ideal. Keep in mind, very few rabbonim are likely to come out with a statement that people should make a concession; farkert, they will encourage less concessions to modernism…but that doesn’t mean that there isn’t room to be meikel. Lemoshul, a rov is unlikely to say to his community to eat Non-Glatt meat – why should they if they can buy Glatt? But that’s not to say that Non-Glatt meat isn’t Kosher. Do you see what I mean? But this is the bottom line: What is wrong with visiting stadiums? And the answer gets unclear, because the problems we see cited are: 1. Avoda Zara, 2. Tzaar Balei Chaim, 3. Retzicha, 4. Gului Arrioyos, 5. Moshav Leitzim & 6. Chukas HaGoy (did I forget any?). Now, if our stadiums don’t contain these elements (I think we can we agree that 1-4 are not our case), then I’m confident that it is fine and becomes a davar reshus – after all, the word stadium is not the problem – however, we need to ascertain what moshav leiztim is all about. I maintain that moshav leitzim can be eliminated if you behave in a way fitting for an ehrlicher Yid. You say that stadiums are de-facto moshvei litzim, but I don’t know what makes it so. Chukas HaGoy may be the biggest issue that I find, and I therefore say that it is best avoided, but for those already exposed I can find a limud zchus. But, with all this back & forth, I would say that you have convinced me that attending sporting events has less of a place than I had thought previously. I still don’t think it’s assur, but after all this I do agree that it should be more found upon.